Each year, towards the end of October, a unique and stunning natural display can be witnessed right by the border of the States of Mexico and Michoacan: the arrival of the Monarch Butterfly. Traveling in colonies of more than 20 million, the gorgeous butterflies of bright-orange colored wings with black veins and white spots on the edges, arrive in the forests and prepare to hibernate, upholstering the oyamel fir trees and the sky itself with their radiant beauty, providing locals and visitors with an exceptional experience bound to stay imprinted in the memory of every spectator on the Monarch Butterfly Tour. While many visitors arrive yearly to witness this amazing spectacle, these amazing insects remain unknown to most people. 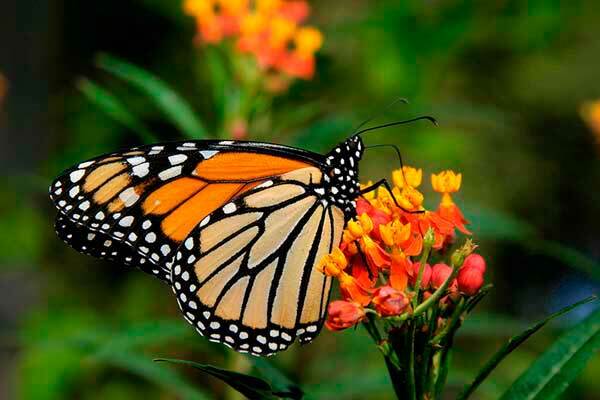 Taking a deep into this mysterious world, we will find out the Monarch butterfly dates back to 250-million years ago. Most of them are born peasant, since they live in the fields of straddling the border strip of the south of Canada and the north of the United States, where wild cotton and milkweed plants -of the asclepia family- grow. The Monarch Butterfly feeds on these plants which contain an alkaloid substance deadly to other species but not for the magnificent Monarch; this substance provides the Monarch with a repulsive scent and taste that keep predators away. In return, the Monarch undertakes a massive pollination task over vast asclepia areas. The typical Monarch life cycle lasts 4 to 5 weeks, starting as en egg, going through the larva period, morphing into a pupa or chrysalis until it reaches the adult stage when it reproduces, and finally, dying. However, when summer is over and temperatures drop drastically, a special generation of Monarch butterflies is born; this new group will have to assume the titanic mission of traveling to Mexico, to warmer latitudes so they can hibernate, feed, mate, and then travel back home. This different kind of Monarch is known as the Methuselah generation. 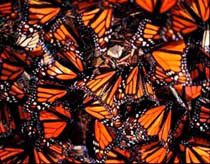 Unlike its ancestors who had only ephemeral lives of five weeks tops, these migratory Monarchs will have longer existences that will last up to eight months, so they can successfully carry out their objective of reaching the oyamel fir forests. Migratory butterflies travel approximately 74 miles per day, taking advantage of ascending warm-air currents, gliding in the thrust they get from it. With this flying technique, Monarchs only need to flap their wings when they run out of wind or when they need to change their path. This way, they achieve to save enough energy to complete their long trip. After an amazing 3100-mile trip, the Methuselah generation of Monarchs finally arrives at the five different sanctuaries located in Mexico, clustering on the oyamel tree trunks and getting ready to be a part of the half of the colony that will endure the winter and predators. By mid-February when temperatures rise and days become longer, the Monarch starts its mating ritual. Once females have lain over 400 eggs each on the fine leaves of the asclepias, they begin their search for flowers to get their nectar and thus gather the necessary energy for the trip back home. By mid-March, copious colonies of Monarch Butterflies can be seen flapping their wings as they wait for an ascending air current to propel them, and so the journey back home starts. Once back in US territories, the Methuselah generation dies and the trip continues as a relay race while short-life descendants fly up north in several generations. Amazing as it is, those Monarchs who will travel back to the sanctuaries in Mexico next winter, have never been there before. It was their great great grandparents who undertook the courageous trip the year before. However, as orientation sense is transmitted genetically, the Methuselah generation of next year will have no problem returning to the same place where its ancestors hibernated. This is the unbelievable journey of an insect that weighs less than a gram, but whose beauty and importance as a pollination agent and as a factor of ecological equilibrium, are preponderant. Do not miss the chance to be a part of this fascinating experience when you visit Michoacan or the State of Mexico.